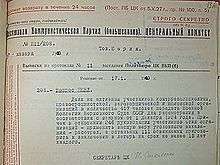 The Politburo (Russian: Политбюро; IPA: [pəlʲɪtbʲʊˈro], full: Political Bureau of the Central Committee of the Communist Party of the Soviet Union, abbreviated Политбюро ЦК КПСС, Politbyuro TsK KPSS) was the highest policy-making government authority under the Communist Party of the Soviet Union. 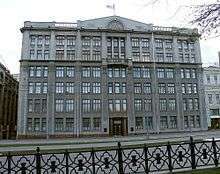 It was founded in October 1917, and refounded in March 1919, at the 8th Congress of the Bolshevik Party. It was known as the Presidium from 1952 to 1966. 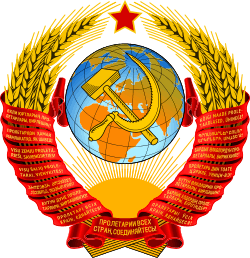 The existence of the Politburo ended in 1991 with the breakup of the Soviet Union. The 8th Party Congress in 1919 formalized this reality and re-established what would later on become the true center of political power in the Soviet Union. It ordered the Central Committee to appoint a five-member Politburo to decide on questions too urgent to await full Central Committee deliberation. 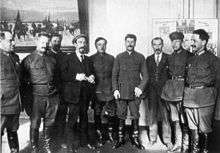 The original members of the Politburo were Lenin, Leon Trotsky, Joseph Stalin, Lev Kamenev and Nikolai Krestinsky. The Stalinist system was based upon the system conceived by Vladimir Lenin, often referred to as Leninism. Certain historians and political scientists blame Lenin for the evolution of the Soviet political system after his death. Others, such as Leonard Schapiro, argue that the system itself, from 1921, evolved an inner-party democratic system to a monolithic one in 1921, with the establishment of the Control Commission, the ban on factions and the ability given to the Central Committee to expel members they deemed unqualified. These rules were implemented to strengthen party discipline, however, the party continued under Lenin and the early post-Lenin years to try to establish democratic procedures within the party. For instance, by 1929, leading party members began criticizing the party apparatus, represented by the Secretariat headed by Stalin, of having too much control over personnel decisions. Lenin addressed such posing questions in 1923, in his articles "How We Should Reorganize the Workers' and Peasants' Inspectorate" and "Better Fewer But Better". In these, Lenin wrote of his plan to turn the combined meetings of the Central Committee and the Control Commission into the party's "parliament". The combined meetings of these two would hold the Politburo responsible, while at the same time guard the Politburo from factionalism. Admitting that organizational barriers may be inadequate to safeguard the party from one-man dictatorship, Lenin recognized the importance of individuals. His testament tried to solve this crisis by reducing both Stalin's and Leon Trotsky's powers. While some of his contemporaries accused Lenin of creating a one-man dictatorship within the party, Lenin countered, stating that he, like any other, could only implement policies by persuading the party. This happened on several occasions, such as in 1918 when he threatened to leave the party if the party did not go along with the October Revolution, or persuading the party to sign the Treaty of Brest-Litovsk, or the introduction of the New Economic Policy (NEP). Lenin, a noted factionalist (see Political faction)before the Bolshevik seizure of power, supported the promotion of people he had previously clashed with on important issues to the Politburo; Trotsky and Lenin had had several years of violent polemics between them, while Grigori Zinoviev and Lev Kamenev both opposed the Central Committee resolution which initiated the October Revolution. The 17th Politburo was elected at the 1st Plenary Session of the 17th Central Committee, in the aftermath of the 17th Congress. Outwardly, the Politburo remained united, but on 4 February Grigory Ordzhonikidze, the People's Commissar for Heavy Industry, refused to acknowledge Stalin's projected economic growth targets, claiming that the majority in the Politburo supported his position. Sergey Kirov, who had turned down an offer to take Stalin's place as General Secretary before the 17th Congress, opposed many of Stalin's repressive policies, and tried throughout 1934 to moderate them. Several scholars have viewed Ordzhonikidze's and Kirov's outspokenness as the rise of a moderate Stalinist faction with the party. Anyhow, on 1 December 1934, Kirov was shot dead – whether he was the victim of a madman or killed on Stalin's orders remains unknown. Not long after, on 21 January 1935, Valerian Kuybyshev died of natural causes, and a month later, Anastas Mikoyan and Vlas Chubar were elected Politburo full members. Andrei Zhdanov, the First Secretary of the Leningrad City Committee and member of the Secretariat, and Robert Eikhe, the First Secretary of the Siberian and West-Siberian District Committee, were elected Politburo candidate members. In practice, the Politburo functioned as the executive branch of the CPSU, and effectively that of the Soviet Union, and its decisions de facto had the force of law. Between 1919 and 1990, 42 members who served as candidate members were not promoted to full member status of the Politburo. Similarly, 32 full members of the Politburo never served as candidate members. More interestingly, 6 members who had served as full members were demoted to candidate status during the Politburo's existence. Ethnic Slavs dominated the Politburo since its establishment in 1919. This isn't strange, considering that the three most populous republics within the Soviet Union were ethnic Slavic; Byelorussia, Ukraine and the Russia. From 1919 until 1991, 89 members of the Politburo were Russians (which makes up 68 percent). In distant second were Ukrainians, who had 11 members in the Politburo, making up 8 percent. In combined third place, are ethnic Jews and Georgians, who had 4 members respectively. In general, in the first half of the Politburo's existence, there was a higher ethnic representation than the second, last half. It was not until the 28th Politburo that every republic had a representative at the Politburo. The Politburo never tried to fix the ethnic imbalance within the Politburo, instead the Soviet Union at the central-level was mostly ruled by Russians. Despite the ideological rhetoric about equality between the sexes, the Politburo came to be a body composed largely of men. Only four women ever served in the Politburo; Elena Stasova, Yekaterina Furtseva, Alexandra Biryukova and Galina Semenova. Furtseva, Birykova and Semenova reached the Politburo under the leadership of reformist party leaders; Nikita Khrushchev and Mikhail Gorbachev. 59 percent of Politburo members (both candidate and full) were of rural origins, while 41 percent were urban. Interestingly, the first members of the Politburo were predominantly from urban areas. For instance, on the 9th Politburo, two out of eight (Trotsky and Mikhail Kalinin) were born in rural areas. From the 1930s onwards, the majority of Politburo members had a father who worked either as a peasant or as a worker. This is strange, considering that one would assume a rise in representation of the intelligentsia as the Soviet Union became more advanced. From 1960s onwards the majority of new members had workers background, as expected. What is strange, however, is that from 1975 to 1981, a sudden increase of people of peasant background took place. When looking at first profession, the majority of members had worked as workers, but the majority of them had attended higher education later in their life (the majority of them choosing engineering). 43 percent of Politburo members attained higher education credentials during their life, while in a close second place, 32 percent of members earned an education in technical engineering. 1 2 "Politburo". Encyclopædia Britannica. Encyclopædia Britannica Inc. 2014. Retrieved 4 November 2014. 1 2 3 Rees 2004, p. 3. 1 2 3 Rees 2004, p. 4. 1 2 3 4 5 6 7 Rees 2004, p. 5. ↑ Rees 2004, p. 6. 1 2 3 Wheatcroft 2004, p. 85. 1 2 3 Rees 2004, p. 2. ↑ Rees 2004, pp. 6–7. 1 2 3 4 5 6 7 8 9 Rees 2004, p. 7. ↑ Rees 2004, p. 8. 1 2 Lowenhardt, van Ree & Ozinga 1992, p. 30. ↑ Lowenhardt, van Ree & Ozinga 1992, pp. 30–31. 1 2 3 4 Lowenhardt, van Ree & Ozinga 1992, p. 31. 1 2 3 4 5 6 7 8 9 10 Lowenhardt, van Ree & Ozinga 1992, p. 32. 1 2 3 4 5 6 Lowenhardt, van Ree & Ozinga 1992, p. 33. 1 2 3 Lowenhardt, van Ree & Ozinga 1992, p. 85. ↑ Lowenhardt, van Ree & Ozinga 1992, pp. 85–87. 1 2 3 Shevchenko 1985, pp. 207–208. 1 2 3 4 5 6 7 8 9 10 Lowenhardt, van Ree & Ozinga 1992, p. 87. ↑ Lowenhardt, van Ree & Ozinga 1992, pp. 87–88. 1 2 Lowenhardt, van Ree & Ozinga 1992, p. 88. 1 2 Lowenhardt, van Ree & Ozinga 1992, p. 140. ↑ Lowenhardt, van Ree & Ozinga 1992, p. 141. ↑ Lowenhardt, van Ree & Ozinga 1992, p. 152. ↑ Lowenhardt, van Ree & Ozinga 1992, p. 153. ↑ Lowenhardt, van Ree & Ozinga 1992, p. 154. 1 2 3 4 5 6 7 8 Lowenhardt, van Ree & Ozinga 1992, p. 155. ↑ Lowenhardt, van Ree & Ozinga 1992, pp. 155–156. 1 2 3 4 5 Lowenhardt, van Ree & Ozinga 1992, p. 136. ↑ Lowenhardt, van Ree & Ozinga 1992, p. 139. ↑ Lowenhardt, van Ree & Ozinga 1992, p. 167. ↑ Lowenhardt, van Ree & Ozinga 1992, pp. 139–140. ↑ Lowenhardt, van Ree & Ozinga 1992, p. 128. ↑ Lowenhardt, van Ree & Ozinga 1992, pp. 129 & 161. 1 2 3 4 5 Lowenhardt, van Ree & Ozinga 1992, p. 129. 1 2 3 4 Lowenhardt, van Ree & Ozinga 1992, p. 131. ↑ Lowenhardt, van Ree & Ozinga 1992, p. 143. 1 2 Lowenhardt, van Ree & Ozinga 1992, p. 145. 1 2 3 4 5 Lowenhardt, van Ree & Ozinga 1992, p. 147. ↑ Lowenhardt, van Ree & Ozinga 1992, p. 149.